Typically this would be performed to relieve pain, numbness or tingling and possibly weakness in the arm. The nerve that is trapped and compressed determines the precise distribution of the symptoms in the arm. The compression may be caused by bone spurs called osteophytes or by protruding disc material. Whatever the cause, a foraminotomy is indicated when the offending structure causing the compression is located laterally (to the side of the spinal cord). In cases where the pressure is more towards the midline, a procedure called anterior cervical discectomy is more appropriate. A cervical foraminotomy operation requires general anaesthesia. You will be carefully positioned for the duration of the procedure and some specialists use an approach where the patient is slouched in a semi-sitting position, while others prefer that the patient lie on their stomach. The specialist will then clean and prepare the back of the neck and make an incision in the skin at the appropriate level where compression of the nerve is present. This is the anatomical position of the key hole that has to be drilled to allow access to the nerve as it is leaving the spinal canal. A part of the top half of the joint (A) and part of the bottom half of the joint (B) is drilled away along with a bit of the top lamina (C) and the bottom lamina (D) (see the chapter Anatomy of the Spine). This is described as a left-sided C2/3 foraminotomy, because the nerve between the second and third cervical vertebrae is being decompressed. 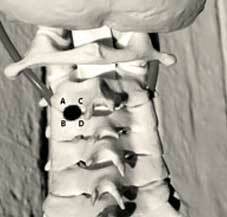 The third cervical nerve root leaves the spinal canal between these vertebrae. The nerve runs directly below this area and the intervertebral disc is directly below the nerve. The nerve root can be decompressed with this approach and disc fragments can be removed. The length of the incision depends on various factors such as patient size, number of spinal levels involved and your specialist's preference. The length of the incision is actually of little consequence with regards to the success of the operation. The amount of soft tissue dissection does, however, dictate the amount of post operative pain. The specialist can follow a midline approach, which actually means that no muscles have to be cut into. This would require a large cut to expose the side of the neck where the decompression has to be performed and is used when multiple spinal levels have to be decompressed. Another approach is to make a small incision directly over the point where the decompression has to be done (see the figure above), and this approach is preferred if there is only one or two nerves that are being compressed. The muscles are displaced to the sides and the lamina of the vertebra exposed – this is the flattened part of the back of the vertebra (see the section Anatomy of the Spine). An X-ray is taken to confirm the correct level and the decompression of the nerve is started. This is normally done by using a fine drill to make a keyhole shaped opening in the bone overlying the nerve. If there is any disc material compressing the nerve, this may now be removed. Afterwards the wound is closed in layers using sutures and covered with a dressing. 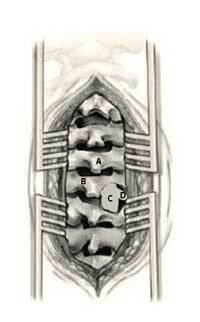 This drawing demonstrates the key hole that has been drilled in the anatomical location depicted at another level on the opposite side of the spine in the first figure. Note how the skin and muscles are being kept open by self-retaining retractors and how the spinous processes (A) of the vertebrae and the laminae (B) are visible through the surgical incision. The spinal cord (C) and the nerve root (D) are visible through the key hole that has already been drilled (the keyhole demonstrated is larger than in real life for illustrative purposes). Loose fragments of intervertebral disc may be removed from underneath the nerve root. You may get out of bed soon after this operation, usually on the first day. You may move around freely, because the spine is not destabilised by this operation. Some specialists may prescribe a soft collar for comfort. Analgesics are normally prescribed for post-operative pain. You would normally stay in hospital for two to three days following this operation and you should have rapid relief of the symptoms in your arms. Your specialist will prescribe analgesics to take home and will arrange for a follow-up visit. A sick leave-certificate will be provided if needed. You should allow yourself two to three weeks for recovery before returning to work. Allow eight weeks for proper wound healing before returning to strenuous activity or sport. Your specialist could prescribe physiotherapy if you had symptoms of arm weakness before the operation. It is important to realise that you will have to protect your neck for the rest of your life and apply good neck habits.